One of the best places in Bhojpur district is Salpa pokhari. It is situated in Dovane VDC, ward no. 8. This place is very famous for religious and tourism aspect. Silichung is a big rocky mountain. Its altitude is 4153m from the sea level. Salpa is renowned for religious aspect; there are temple, pond, rocky mountain and dense jungle. Many pilgrimages visit there for mitigation sin and pray or offer something to God for better livelihood. If anyone wants to visit Salpa pokhari at least they have to manage a week's time for going and returning from Bhojpur headquarter. Many witch doctors go there from different places to perform magical power and get stronger themselves. Silichung peak is bordered by four districts; Bhojpur, Khotang, Solukhumbu and Sankhuwasabha. The routeway from Bhojpur and Temke, continuously, Maiyang dada, Satdobato, Laure, Hadipokhari, and finally Salpa pokhari. Laure has its own different identity, everyone should offer a stick in this area that is why its name itself Laure. According to the ancestor, there used to live 5 Devis in Laure, so visitors pray for their safe/better journey until the end. There is another pond (Pokhari) Hadi Pokhari, according to old adage Hadi Pokhari is a step (Sauta) of Salpa pokhari, therefore when one crosses the pond shouldn’t look back. 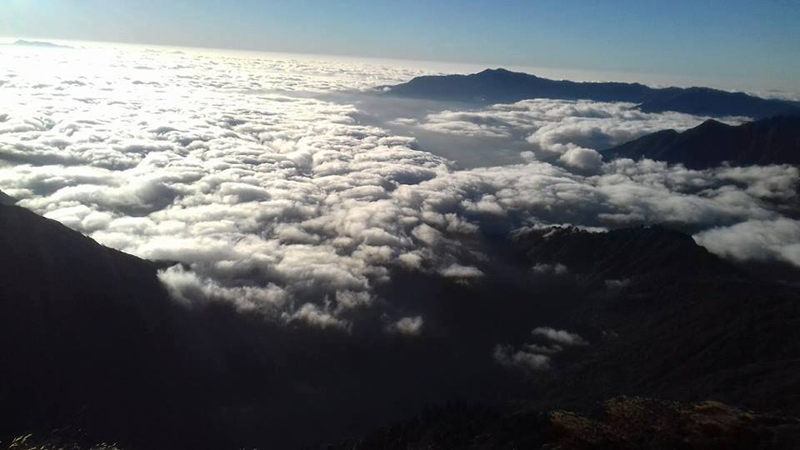 Salpa Pokhari is situated at an altitude of 4000m, which another amazing peak is the Silichung, which is by the side of Salpa Pokhari. Silichung is an amazing peak some people might have an altitude problem to reach there. From the top of the Silichung we can view the Himalaya range, mountain, Namche bazaar inside visitor's eyes. The name Silichung is given by Bantawa ancestor, which means a big rock in Bantawa. Here we can get various types of herbs like Sunapate, Bhairungpate, Pakhanbet, Bikhuma etc. An enchanting vista of nature gives visitors euphoric pleasure. They feel as if a piece of heaven is drop down to earth after viewing this place. This is one of the best travelling destinations for Nature lover i.e. make your trip haunting and unforgettable. Kathmandu to Bhojpur by Airplane or by Bus (by bus takes two days extra time).